This chapter discussed about the introduction of the study, objectives, significance of the study and its scope and limitation. The Information System is ever changing in trend technology brought the necessity for the automated of everything. 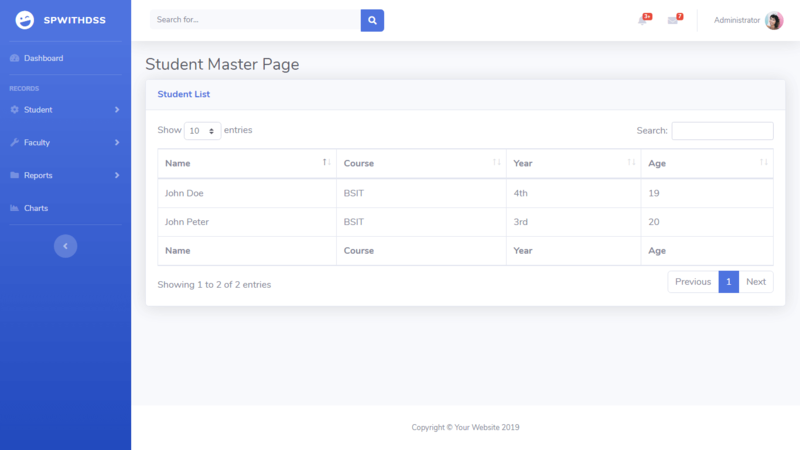 The student information system is a computer application that deals with the generation, collection, organization, storage; retrieval and dissemination of recorded the file. The term “student profile” is used in several different senses in the education community. In all cases, a student profile provides information about a student, but the information can be presented and used in different ways. Student profile can include data submitted by a student, as well as information which is added by staff members in an educational institution to provide a complete picture of the student. Access too many type of student profiles are restricted due to concerns about security and privacy. Student record system, thus play a key role in the overall functioning of the education system; but more importantly, they increase a school’s ability to meet the needs of students. Many schools, school district, and state education agencies already collect and use data effectively. The researchers conducted a study to implement a system that will keep track all students’ personal data in the Guidance Office and provide an easy and manageable way of keeping the college students’ record i. The Students’ Profiling System is the first software application to be developed for Guidance Office to manage all confidential data that needs to be kept and secured. The researchers was aim to develop a usable system for the profiling management of the students. This chapter contains the related concepts about the study. The contents were contemplated as the foundation in perceiving the need and demands of the application to improve the Students’ Profiling System. Complete school management software that effectively performs records and profiles management. This profile management system captures master data such as name and contact information of the student, parents, teachers and other supporting staff. http://www.topshareware.com/School-Management-System-SMS-download 47712.htm. Student profiling attempts to identify students likely to be violent based on traits, characteristics, and/or behavior (e.g., detachment from school, unusual interest in sensational violence, and turbulent relationships with parents). Student profiling has an effort to identify at an early stage, those students who are most likely to initiate such violent acts. http://www.sourcecodeonline.com/list?q=student__profiling. The related concepts and studies included in this study have bearing in the development of the Students’ Profiling System. The related studies are very similar to the present study in the sense that it emphasized the significant role of the developed Students’ Profiling System. The related studies were very useful in the framing and formulation of the survey questionnaire and the interpretation and analysis of data and most of all, it helped in the development of the system. It only shows that the need of implementing the developed Students’ Profiling System will contribute a big help not only to the school but also to students to enhance the managing and updating of students’ profile and record every enrollment period. This chapter discussed all methods used by the researchers, which includes the selection of software development life cycle model, software development procedures and methods being used including the requirements phase, design phase, initial testing phase and the final testing of the program to successfully come up with the developed system. Using a survey questionnaire the method used by the researchers was the descriptive type of study. This method used to discuss the actual condition, situation and practice in the Guidance Office. The focused of this type of study is to seek the respondents’ perspective and experience. It also calculates the mean and interpretation of the questionnaire which contain the various functions that deal on how Students’ Profiling System is in demand to be implemented. The waterfall model is a sequential, software development process, in which progress is seen as flowing steadily downwards (like waterfall) through the phases of System Requirements, System Design, System Implementation, System Verification and System Maintenance. 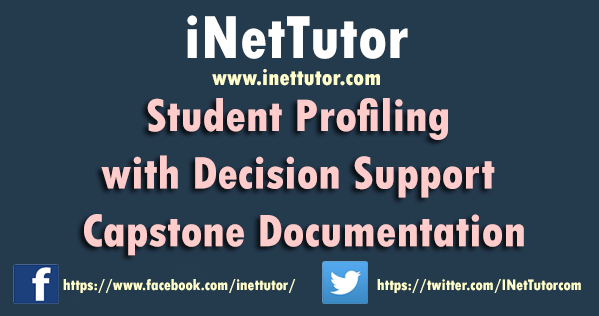 The requirements needed for the development of the Student Profiling with Decision Support includes the respondents in this study which are the guidance office personnel and the class advisers. Then the validated questionnaire used by the researchers for conducting a survey and the gathered data needed in order for this system get developed. But before they conduct it, the researchers made a letter asking permission to conduct immersions and survey to the said school (See Appendix A). The first step that researchers have done is that, they make survey questionnaire for them to know what their problems are when it comes to managing the information and their manual operations they would like to automate. 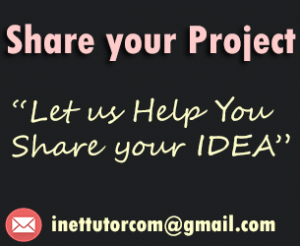 After the researchers make the questionnaires, they ask three professionals, which is composed of two I. T. Expert and one English Major Teacher to evaluate and validate it. The researchers provided the criteria set of Carter V. Good and Douglas F. Scales to the three professionals to evaluate the questionnaire. The questionnaire received 4.37 and it means that the questionnaire is very good and it is ready for conducting a survey. After the evaluation of the questionnaire, the researchers set out to conduct a survey. The survey we conducted is about the feasibility study of our proposed system in their institution. We handed the survey questionnaire to the guidance/registrar’s office personnel whom manages the records of the students and to the class advisers of the school who are in charge in the students’ grades. Then after the survey, the researchers solved the mean to find out the result. For the guidance/registrar’s office personnel, the mean is 4.15 which interpreted as very important. As for the teachers, the mean is 4.53 and it is interpreted as very important. This phase discussed the implementation of Students’ Profiling System where in (3) experts evaluate the developed system. This phase also discussed if the recommended functions and suggestions of the respondents and users are met. Initial Testing Phase. The pre-installation of the Students’ Profiling System, three system developers evaluated the system. The evaluators were professionals who have broad knowledge on a computer-oriented application. For the evaluation of the developed Students’ Profiling System, the researchers made a letter and personally set an appointment with the selected system developers for software quality assurance evaluation using the McCall’s Software Quality Model Evaluation Form. After the system was evaluated, the tabulation of the Software Evaluation Results follows. Final Testing Phase. The final testing of the system was conducted after the initial testing was done. In this phase, the researchers made a letter to the intended users, attached is the Part II of the self-made questionnaire which is the User Acceptance Evaluation Form where in the intended users was the one who tested the effectiveness of the developed Students’ Profiling System if the desired functions were met. Guidance Office Personnel. The overall head and in charge of the Guidance Office and the one who keeps the security or password of the developed system. Working Scholars. They are also the authorized person assigned in the Guidance Office to use the developed system. This is the feed backing process of the Students’ Profiling System after it was implemented and undergone testing to the three (3) experts and its intended users. It informs the developer if there are any suggestions, flaws, bugs and if the systems functionality worked well. This phase is virtually a never ending phase of the software model. Generally, problems with the system developed will come up after its practical use starts, so the issues related to the system can be solved after the deployment of the system. It also includes upgrading the system. The proposed system is called the Student Profiling with Decision Support is a big help when it comes to managing of the student records. The conducted survey in our client shows that this kind of system would be very important to them. After that survey, the system has been developed and it passed through a series of testing which were the initial test and the final or user acceptance test for the system to be evaluated and rated. The initial test which was the system was evaluated by the three IT professional and the result shows that the system would be valuable to the beneficiary. Then lastly the final test or the user acceptance test which is the system has been evaluated and rated by the guidance and registrar’s office and the class advisers of the school and it received positive feedbacks from them and most of them considered to adapt this kind of system. As the results shows by the series of testing and evaluation, the researchers concluded that the school needs the profiling system and the faculty to manage the students’ records in an organize manner using the database system. This system would be very beneficial in their institution. The researchers highly recommend this system because it has the features that the registrars’ office and the class advisers needed in order for them to manage the grades a lot more easy.